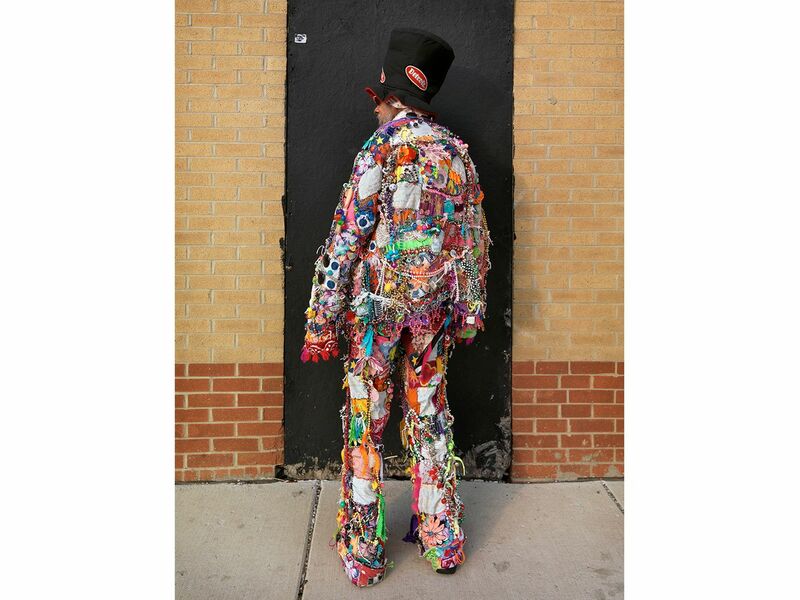 Robert (Mr. Rock and Roll) has been fashioning this hand-made suit for the past thirty years. Made from cheap dime store trinkets, it weighs over 20 pounds. Robert let me try on the jacket, but in all honesty it looked much better on him than it did me. 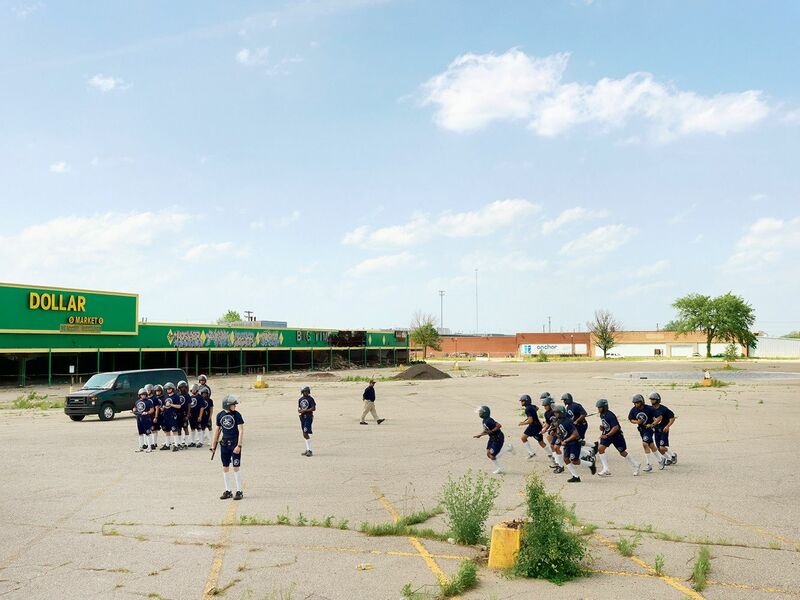 The Detroit Police Academy will often train cadets in open public spaces in order to show local residents that their tax dollars are going to good use and to promote better public relations. Until further notice from city hall, this small group of cadets is the last graduating class from the academy for the foreseeable future. Lawrence reads the bible daily but doesn't go to church. He says that the bible is all you need; the rest will take care of itself. He doesn't live far from where the '67 riots took place and he remembers it as if it were yesterday. All he wanted to do at the time was to keep his family safe. The riots deeply divided the racial boundaries between the city and the suburbs, contributing to Detroit's economic decline. Nick and his friend Joe were painting a block of empty shop fronts which will be rented to new tenants. The buidlings, although vacant for a few years, were in better than average condition and had not been vandalized. A brush and bucket of paint can be a powerful weapon for change. 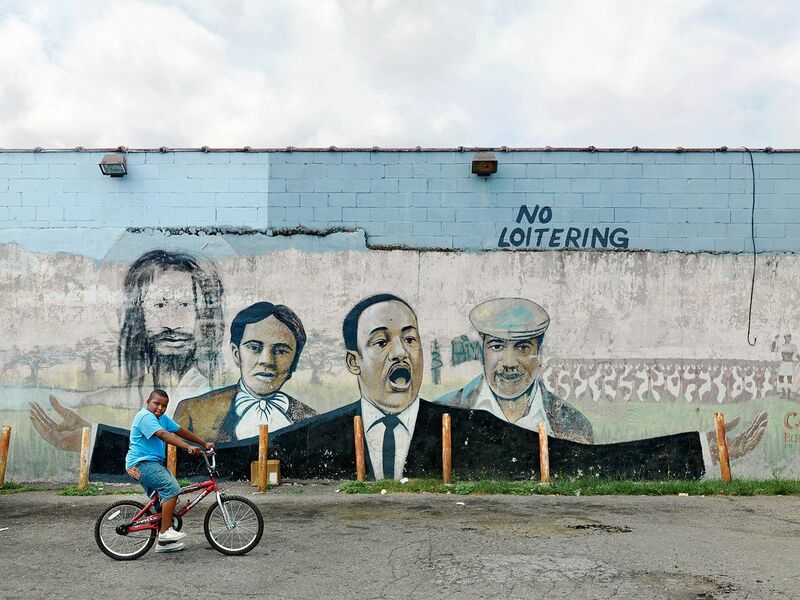 Portrait of a young boy standing in front of a mural depicting African-American role models. 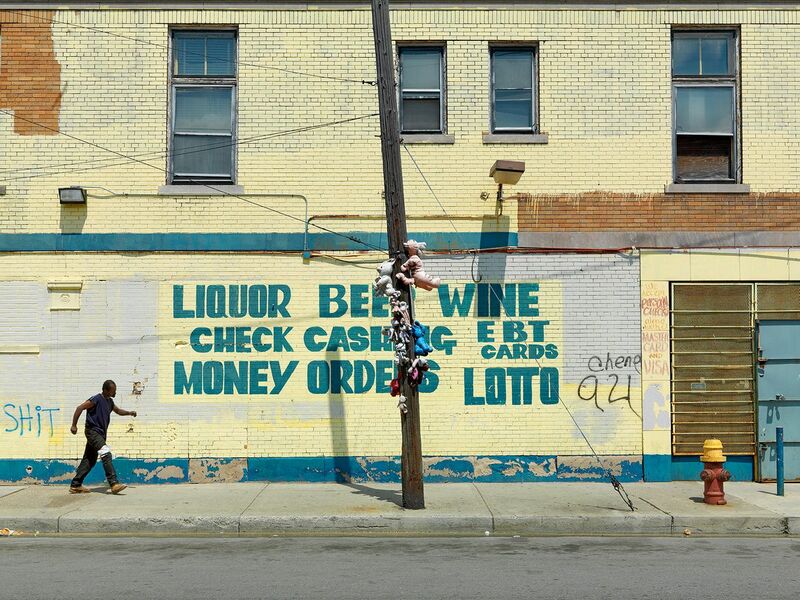 Detroit has been designated a "food desert". Except for one Whole Foods and a Meijer’s, there isn't another national grocery store chain within its city limits. Residents instead have to rely on small independent stores like this one for their basic needs. This store sold food items, but the ubiquitous liquor and beer signage is really where the profit is. To counter this shortage, it's estimated that Detroit has over 1200 community gardens scattered throughout the city. The stuffed animals hanging from the utility pole represent a memorial to someone who was killed on that spot. After living homeless for several years, Tom built himself a one-room cabin on a small patch of abandoned city property perched along the Detroit River. It measures about 7 X 10 feet. All of his building materials are derived from discarded items found in construction site dumpsters. He has lived the last ten years at this location, first in a small 4 X 6 foot hut that he built atop a 15 foot high abandoned railroad embankment. Extremely resourceful, introspective, and independent, he has lived without the luxury of heat, electricity, or running water. His is currently constructing his third house that he's been building for the past two years and plans to complete by the summer of 2018. It will measure 16 X 16 feet which will be four times larger than his previous house. He's done all of this with nothing more than a hammer and a hand saw. The small cabin that Tom built and lived in for eight years. The scale is somewhat deceptive in that his front door is only four feet high and 18 inches wide. A newlywed Inter-racial couple in their front yard. Jose' doesn't know who owns this vacant lot, but he mows it anyway because he's concerned for the safety of his three children who often play there, and it makes what's left of the neighborhood look less abandoned. This sign was made by Andre Ventura, a resident who lives on the street after several gun shots were fired while children were playing in the corner park. He said you could hear the bullets flying overhead. The sign (not the gunfire) garnered the attention of several TV and radio stations that covered the story of Andre's vigilante antics. Andre has made over 250 hand painted signs that he has placed throughout the city to create awareness about crime, social issues, and political corruption in the city. One of over 250 signs that Andre has hand painted and placed throughout the city to create awareness about crime, social issues, and political corruption in the city. Small businesses with minimal budgets for advertising often hire non-professional sign painters to create distinctive murals in order to attract the attention of customers. Stylistically, much of the work has a primitive, outsider art quality and has become the ubiquitous visual language for many neighborhood shops, especially in poorer areas. Jack's barbershop sits in the middle of an abandoned block. There is one other barbershop in the neighborhood, but Jack's is open on Monday's while his competition is closed. It helps to bring in more customers, he said. Bo's mother owns the house he lives in but she had to move into an apartment building after the neighborhood became to dangerous. Bo spent five years in prison for drug dealing and after his release came back to reclaim his house which ironically had been overtaken by drug dealers. Still without a job after two years, he complains that the state's prisoner re-entry program has not helped him much. The man on the right, Ricky Zepeda, was murdered a few months after I took this picture. A victim of a senseless car-jacking on the corner of Military and Regular Street. Life long friends, David and Juwan were on their way to hunt for snakes in the park. The Campbell Street scrap yard has become a popular destination for several different groups of metal scrappers who dig this yard for buried metal. Scrapping is a profitable business and a large proportion of it is done illegally. These two young men, working in an abandoned open field, had just uncovered a 300 pound sheet of steel that they're standing on, but had not yet figured out a way of transporting it to the recycling yard. It's worth about 40 dollars. As one of the gentlemen said, Waste not, want not. Robert is a freelance music producer but has had few job opportunities lately. Living in his deceased parents house but with no running water or heat (he does have jury-rigged electricity to his one bedroom), he was forced to spend the winter months on the streets of L.A. last year to get away from the cold. He boarded up the first floor windows to his parents house before he left, but that was a signal to looters that the house was empty, so they broke in, ransacked the house, and stole the hot water heater and several copper pipes, which flooded the basement. The city then sent him a $4,000 water bill. 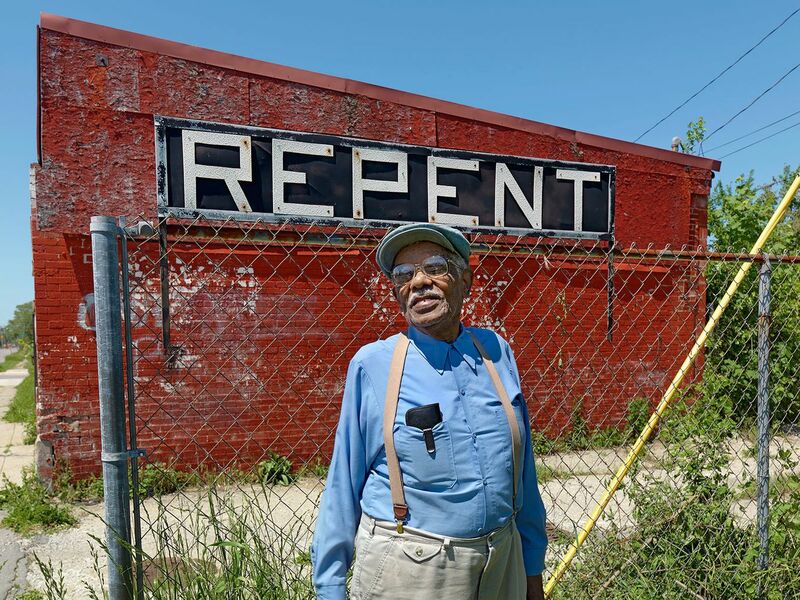 Mr. Boyd has run this small part-time party store which local residents have heavily relied on for basic needs since 1990, but health issues plus the decline in the economy and the neighborhood will force him to close his shop this year. This abandoned house was used by drug addicts and prostitutes, but neighbors couldn't get the city to tear it down. A neighbor took it upon himself to begin dismantling the house with a chainsaw and then painted remarks on the building. It finally collapsed in on itself. Kovac's has been in business for over 80 years and was once a thriving bar and restaurant for local factory workers from the neighboring Zug Island steel mill. But, when the mill put a ban on workers leaving the island for lunch, Kovac's business all but dried up. Now only a few patrons visit daily and they no longer serve food. Kovac's also sits directly in the path of the newly proposed international bridge to Canada whose fate is mired in the state's legislature. The present owner, hoping to retire, is unable to sell the building because of its uncertain future and has since closed the tavern. Michael lost his feet after he jumped out of the second floor window of a burning building. He recently moved in with his girlfriend and three others into a small run down house just east of Eastern Market. He often wheelchairs over to the I-75 and Mack Ave. freeway entrance or to Comerica Ballpark during home games and waits (he never asks) for donations.Sadly Michael and a friend were killed by a hit and run driver one evening in August of 2013 while returned from a Tigers ball game. A young man with a tattoo and dressed in typical street protocol. Donks, also known as hi-riders, are modified Amercian made cars (typically from General Motors) built during the seventies and eighties. Fitted with oversized (22-28 inch) rims, low-profile tires, and custom paint jobs, they have gained popularity among middle-class blacks as symbols of economic prosperity. Originating in the south, they are now very much a part of the Detroit culture. Donk gatherings are common on Belle Isle park.